Don’t wait until it’s too late to protect yourself from accidental slip-and-fall accidents. In the winter months, it’s common for ice to accumulate on walkways, driveways and in parking lots. Slipping and falling on icy patches result in hundreds of injuries each year and are one of the most common types of personal injury claims. It’s important to note, however, a slip and fall may involve wet floors inside a building, broken sidewalks, staircases without handrails or area rugs without a proper grip pad underneath. As a business or homeowner you have a responsibility to ensure your property is safe and free of hazards to the best of your ability. That includes clearing snow and ice as quickly as possible. You can be held liable if you fail to do so and, as a result of your negligence, someone slips and endures pain and suffering. The responsibility stems from the Occupier’s Liability Act, which states you must take care to ensure that a person entering your premise is reasonably safe. There are ways to protect yourself in the event of a slip and fall occurring on your property. Many home insurance policies include liability coverage. This important coverage can be the difference between being protected and dealing with a huge hassle and expense. Liability coverage covers the insured if anyone sues them for their personal actions for bodily injury or property damage. Anywhere in the world, this would cover any legal costs and settlements. In other words, it protects you if you are responsible for accidently injuring others or damaging their property. Most home policies come with a standard $1 million in liability coverage which can be easily increased to $2 million. 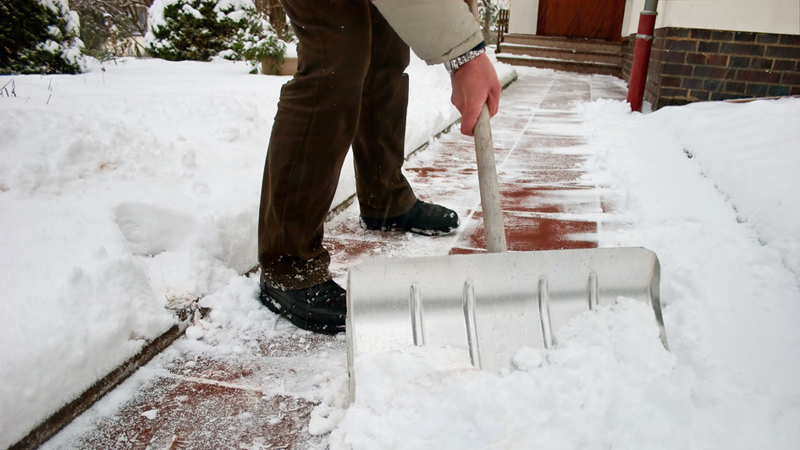 Plan ahead and make sure you have the proper tools for snow and ice removal: snow shovel, ice chipper and salt. Snow is best removed as soon as it falls, to avoid it from getting packed down. Ice is best removed during the day when it is a little warmer outside, making the ice softer and easier to move. Sand or cat litter can be used on ice in place of salt to allow pedestrians to have a better grip. This winter make sure you’re covered and leave the ice on the hockey rink.